POLITICS: I became aware of politics during teenage as I began to take an interest in how things are organised and how people can contribute in that process. My family on the whole are a mix of democratic socialists, with some being members or ex-members of the Labour Party. I joined the Labour Party myself briefly but soon became disillusioned with New Labour and so I left and joined the Green Party. Politically I am somewhere between the environmental left and a libertarian. I believe strongly in the United Kingdom being a committed secular state and one day becoming a federal republic. Democracy is important to me and while it has its limitations, it is surely better than having systems based on theocratic, monarchic, fascistic, communistic or military dictatorship! Apart from being a Green Party member I am also a supporter of various non-governmental organisations and trade union movements, such as Friends of the Earth, Amnesty International, Global Justice, Unison and various other movements…I would describe myself as a local activist and have been chairperson of both my local Green Party, Friends of the Earth and a Hospital Unison Branch. RELIGION: as a child I grew up in a loosely-engaged Roman Catholic environment and now and then attended church and went to Roman Catholic infant and junior schools in Hemel Hempstead. My mother was then an agnostic/Roman Catholic and my father an Atheist, though christened as an Anglican. As a child I was imaginative and animistic in expression, I loved Greek mythology and the occult in general. When I attended church I liked the rituals and felt a genuine connection to the mythic presence of Jesus Christ within me. However I was not interested in church doctrine or theology at that time. As a teenager I began to dream of what I wanted to be and roles such as actor, psychologist or priest came to mind. 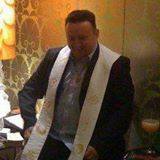 I soon began to examine my church more closely and discussed with my parish priest becoming one myself. However it was then I began to find many things both doctrinal and biblical that I just could not agree with. Also my awakening sexual orientation contributed to me leaving the Church and organised Christianity as a whole. I pondered Atheism and Humanism as a teenager. Though they resonated with many of my criticisms of organised religion I felt in my core being that the world they described wasn’t the whole picture. I began to explore the world religions and was drawn to the many forms of ancient and contemporary European Paganism and the eastern religions such as Buddhism, Hinduism and Taoism. I was fascinated by my ancestry that was a mix of English, Cornish, Irish, Scottish, German and French (with some Jewish ancestry thrown into the bloodline somewhere back). With my interest in history and mythology, I began to study both Germanic and Celtic forms of pre-Christian religion. It was in my late teens that I labelled myself as a Pagan and joined groups in both Asatru (Germanic Heathenism) and Druidic (Celtic inspired Paganism) organisations. In my general experience of Druidry I never came across organised homophobia or any discriminatory behaviour. 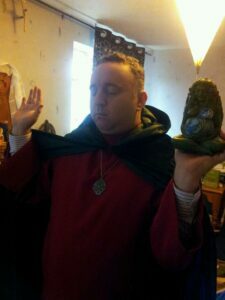 With this, alongside my cosmological and spiritual orientation I began moving towards becoming a Druid-priest. At the same time in my late teens I discovered various other paths and the most influential in my spiritual unfolding was the various forms of Buddhism. I often visited my local Theravada Monastery near Hemel Hempstead called Amavarati, which I still do time to time. However in my early twenties I found my self drawn more and more to Zen and Vajrayana Buddhism. Alongside Buddhism I am drawn to Tribal Animism, to Western Neo-Shamanism and this also shaped as a lens in my practice and vision of modern Celtic inspired Druidry. I would label myself both as a Buddhist and as a Druid, I also am inspired by various other movements, such as Gaian Mysticism, Spiritual Humanism, Deep and Reverential Ecology to Transpersonal and Eco-Psychology. 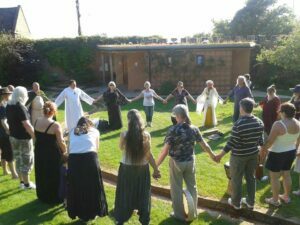 In my Thirties I became involved in interfaith work as I facilitated my own Druidic group for a number of years as a priest and worked as a Druid celebrant and ad-hoc volunteer chaplain for a hospital/hospice and the police. There I became inspired by the mystical heart of many religions and thus trained as a Spiritual Counsellor and Interfaith Minister. Theologically I would say on one level I am an Animistic Poly-Pantheist and on the other feel in that relational spiritual experience that ground of being, a wholeness which a Vajrayana Buddhist may describe as Primordial Awareness. My interfaith training and that vocation has developed my sense of being in the world, which has developed my Druidical crafts as well my role as celebrant and chaplain. 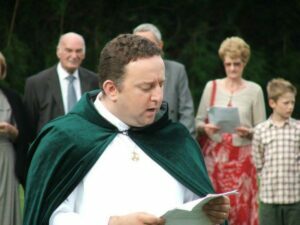 From that I have become active in interfaith groups and am currently Chairperson of Dacorum Interfaith Forum. My spiritual vocation has also brought me to study formally and informally therapeutic counselling and personal coaching. In time I plan to academically study more in the fields of transpersonal counselling and eco-psychology so that I can make these fascinating fields accessible to all, regardless of economic status. Next week in, INDIA, MY MUSE, Neil Beardmore writes about his love of India and how it inspired his debut novel, Lemon Seas.